Many Mac users rely on iPhoto for their image management and to pull pictures from a digital camera, an iPhone, or Android, a generally flawless experience that makes handling tons of digital pictures easy. 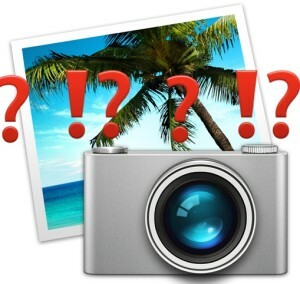 But once in a blue moon iPhoto goes awry and you may experience a variety of peculiarities with the image database, the most common of which seems to be the sporadic disappearance of photo thumbnails that typically display in the iPhoto apps browser. If you launch iPhoto to discover that all thumbnails of your images are missing or not visible, follow this simple multi-step process to rebuild the thumbnail database. 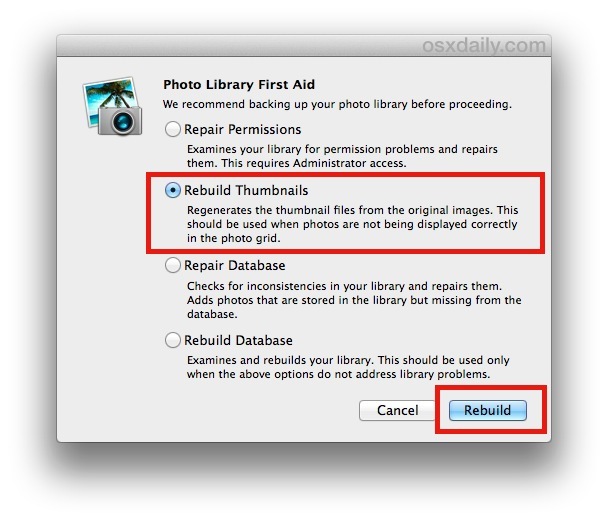 If you happen to encounter some other odd behavior in iPhoto as well, some of the other Photo Library First Aid tasks may resolve the issue, but our primary focus here will be on rebuilding lost thumbnails so that you can browse the image library again as usual. As mentioned under the button option, the task “Regenerates the thumbnail files from the original images. This should be used when photos are not being displayed correctly in the photo grid.” In other words, you’ll have to have the original photo library present in order to create new thumbnails from those images. If for some reason the iPhoto library is missing, you may want to double-check that it exists where it’s supposed to on the file system, and then choose “Repair Permissions” from the same First Aid menu. If you’re missing the iPhoto library completely, you’d likely need to restore it from a backup. Once the thumbnails have been regenerated, you’ll be back to seeing the typical image based browser within iPhoto, with the smaller thumb nailed versions of the pictures showing a preview of each photo in the library. As usual, selecting any of the thumb nailed previews will open the full size version. This rebuild feature works like a magic and thanks Mag66 for the short cut key. I was looking for this help, appreciated.